4.30 a.m – Morning Patrol: We get up, rain or shine, and meet at the pavilion with others to head down to the beach. 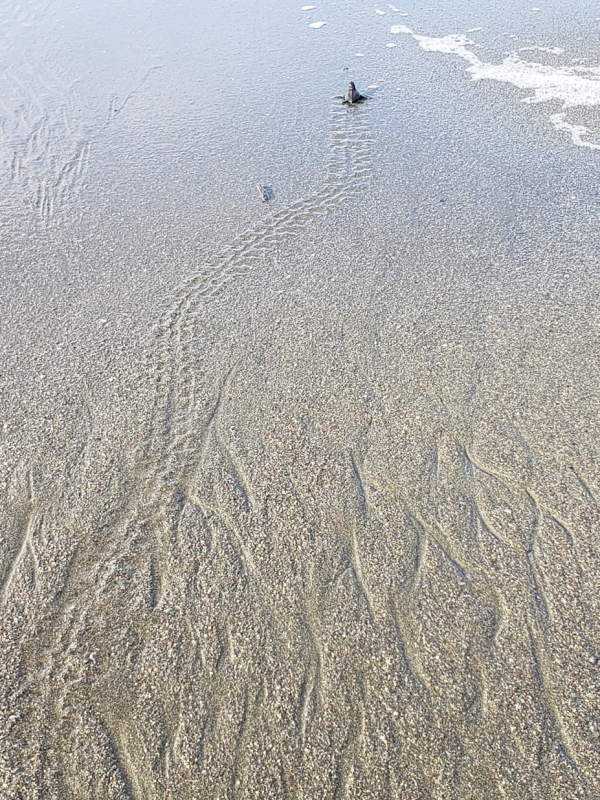 Then, we start searching for turtle tracks to locate nests using the first light of day. Two different turtles come to the coasts of Piro beach at this time of year – Green Turtles and Olive Ridley Turtles. After we find the tracks and locate the nest, we dig a small hole to take the eggs out. When taking the eggs out, we have to be careful not to rotate them because they are still developing. We move the nests that are in danger of possibly drowning from high tide or river flooding. 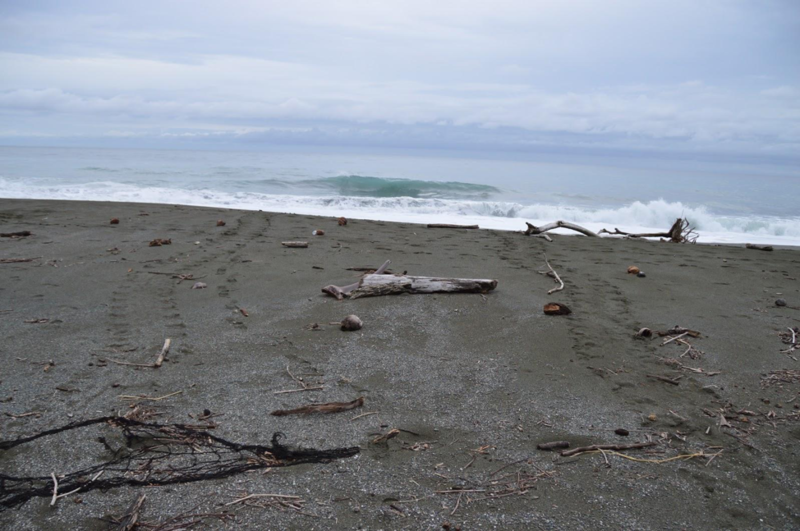 The tractor-looking marks on either side of the log in the middle of the picture are Olive-Ridley tracks. 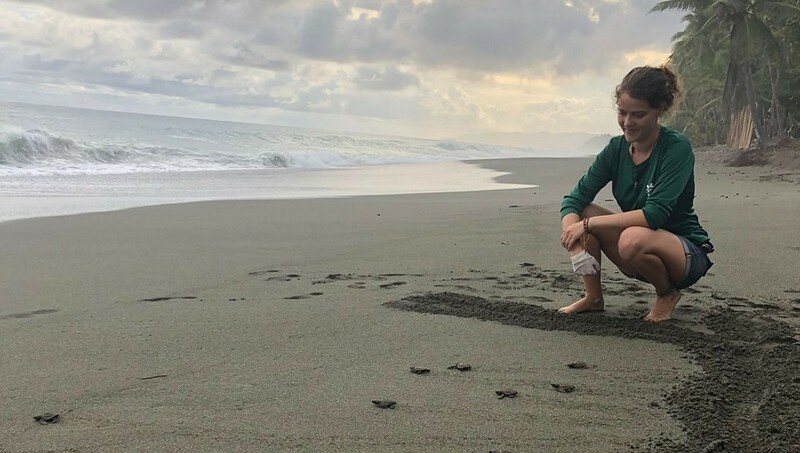 For each nest we relocate, we mark the date, the sector of the beach it was found in, the time it was found, count the eggs, and measure the width and depth of the nest to simulate a similar nest in the hatchery. After collecting the eggs, we go to the hatchery, where we safely relocate the eggs to ensure a better survival rate by recreating a similar nest to the original one. Before we start placing the eggs in the new nest, we record the weight of the first 20 eggs that are put in the nest. 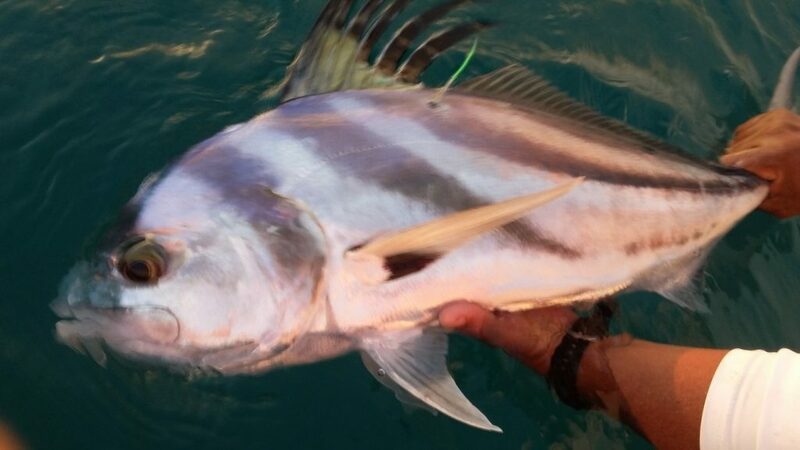 Their average weight is an indicator of whether or not a female is laying eggs for the first time this season. For the first few nests a turtle lays, the eggs are stronger, and therefore heavier. Finally, we cover the nest with a mesh net to keep predators out. After collecting the eggs, we go to the hatchery, where we safely relocate the eggs to ensure a better survival rate by recreating a similar nest to the original one. 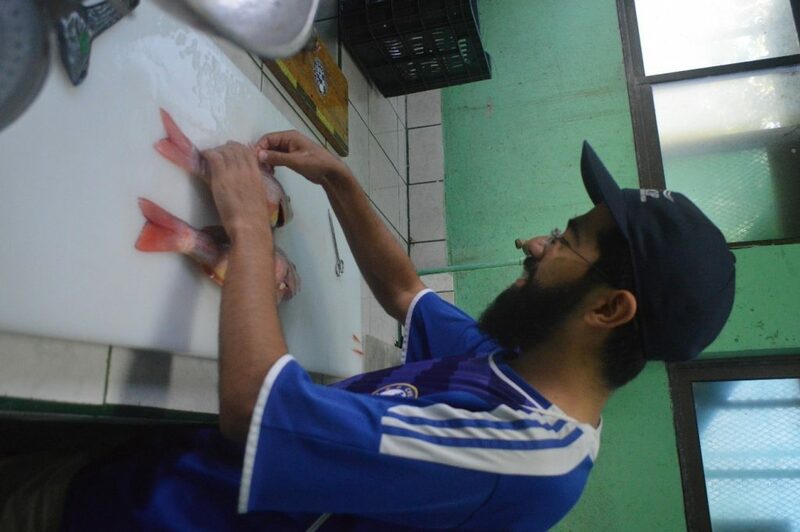 3pm – Hatchery check: We check the hatchery for newly born turtles. 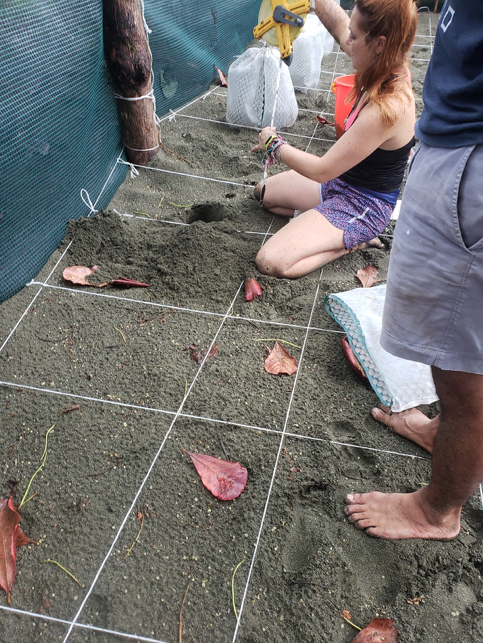 It is a simple process where we lift open the mesh nets and pat the sand for any indication of baby turtles. 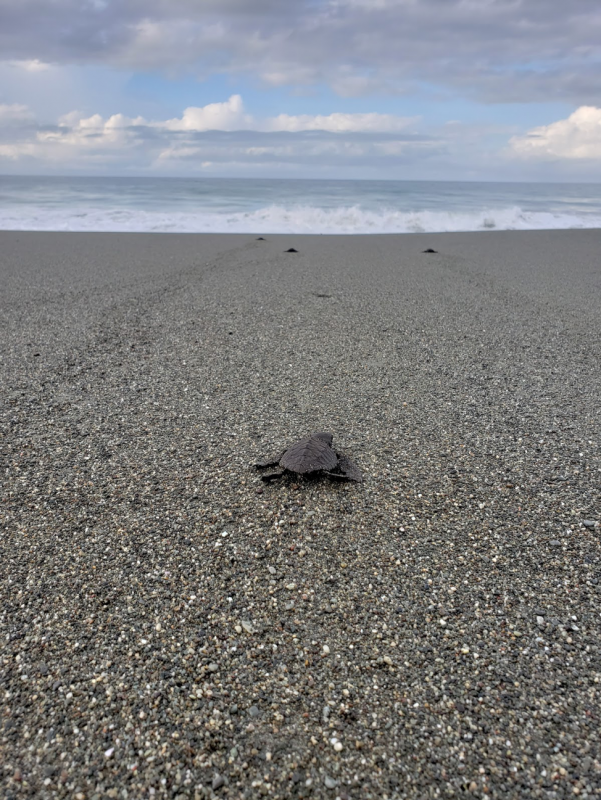 It takes about 60 days for the turtles to hatch and make their way out of the sand. Almost every other day, we run across a newly hatched nest. Then we release them! The line which people stand behind and from where we release the tiny turtles. 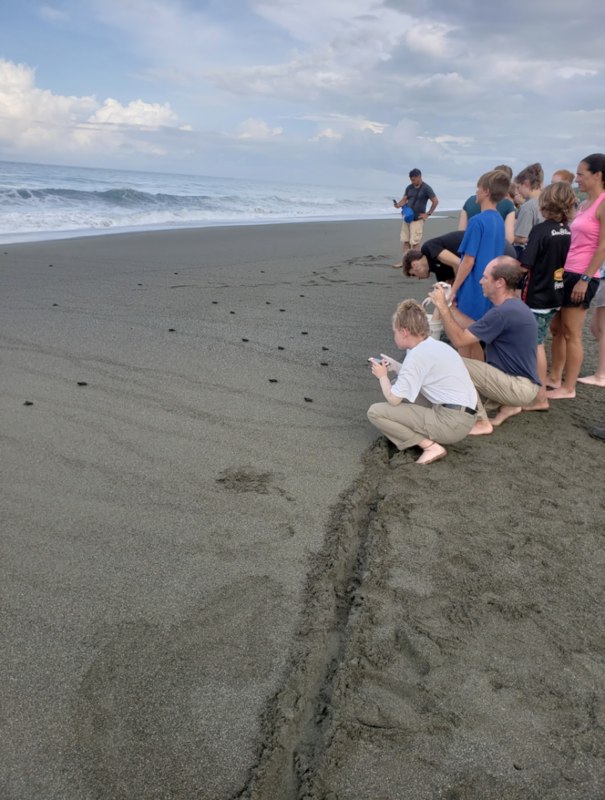 The line is 6 yards from the water line to ensure that the turtles use their muscles before they make their way through the ocean. 8 p.m. – Night Patrol: We make our way again to the beach to begin our search for nests. If we see a turtle coming up on the beach or already creating a nest, we wait back to avoid disturbing the turtle. 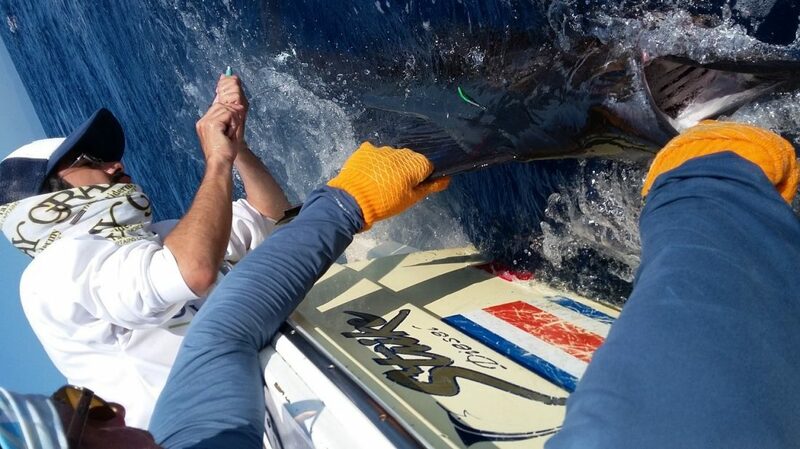 When she starts to lay her eggs, she goes into a trance-like state, and we tag both of her front flippers. We also record the length and width of her shell as well as the number of scales on her back and between her eyes. After she finishes laying her eggs (this process can take up to an hour), we turn off the lights and watch her go back into the ocean. If the nest is in a dangerous spot, it will be dug up and moved to the hatchery. 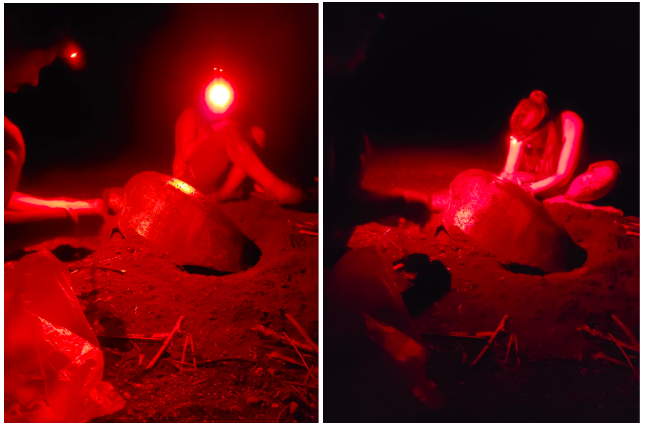 During night patrol, red lights are necessary as not to disturb the turtles. This schedule reflects what my days have been like during my two weeks in the Osa peninsula. 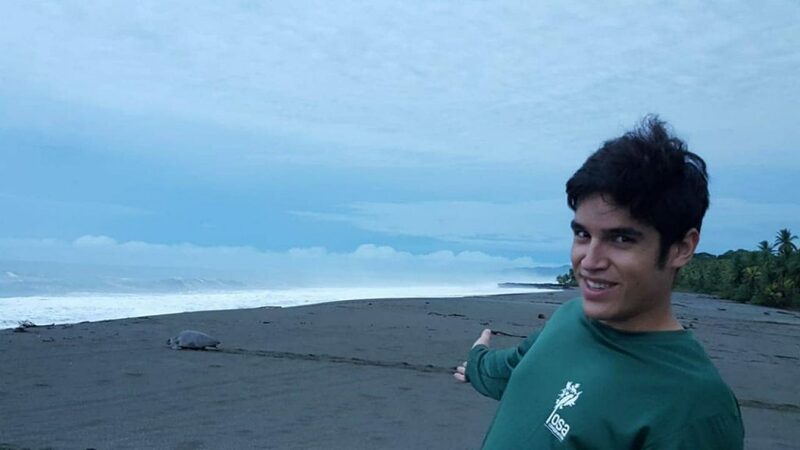 It was a wonderful and amazing experience, from witnessing the mother turtle lay her eggs to watching the little babies make it to the sea. I was fortunate enough to see this little part of the circle of life with my own eyes. I can’t wait to one day come back to this magnificent corner of the world. 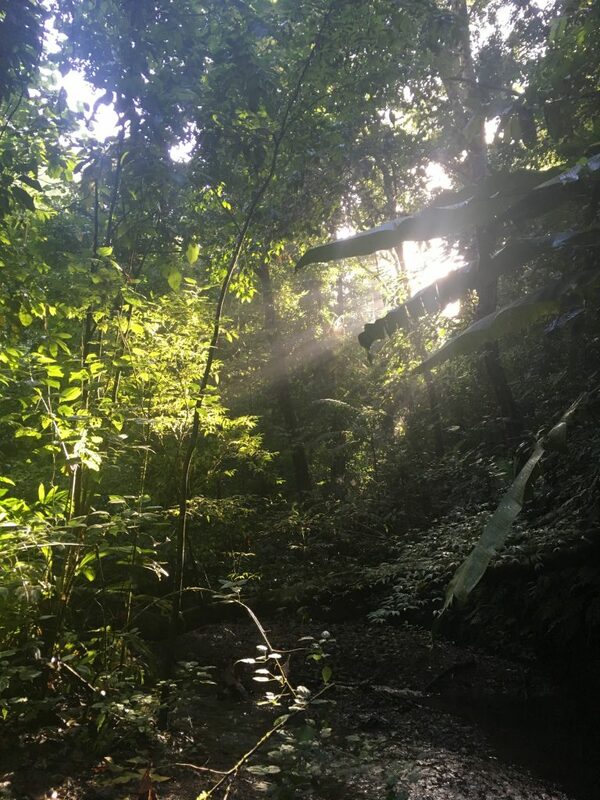 The daylight was rapidly disappearing, as we clambered through the thick undergrowth, over vines and palm leaves bigger than me, then across a muddy stream and still more dense brush. Then, we heard it again – a long, mournful series of calls that sounded like a child laughing, or perhaps crying, in the distance. We all stopped, holding our breath; the only sounds were the omnipresent croaking of the frogs and the pumping of our excited hearts. Then, as casually as if he were pointing out a Balsa tree, Manuel said, “There it is,” as he pointed into the canopy of a large tree overhead. 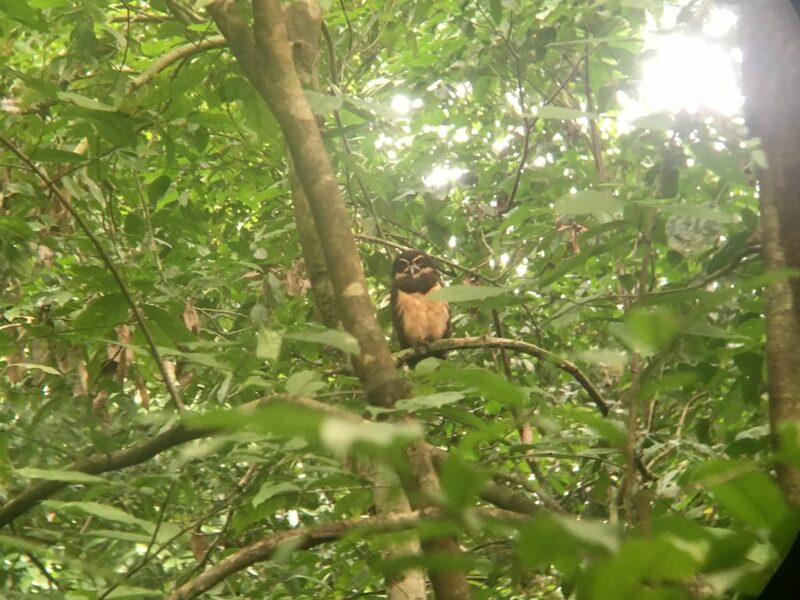 Sure enough, the Common Potoo that two other young eager birders and I had been seeking was sitting calmly on an overhanging branch high above, perfectly camouflaged against the bark in its mottled gray plumage. The potoo, which is a nocturnal bird related to nightjars and nighthawks, was just starting to wake up from its daily snooze as the light began to fade. 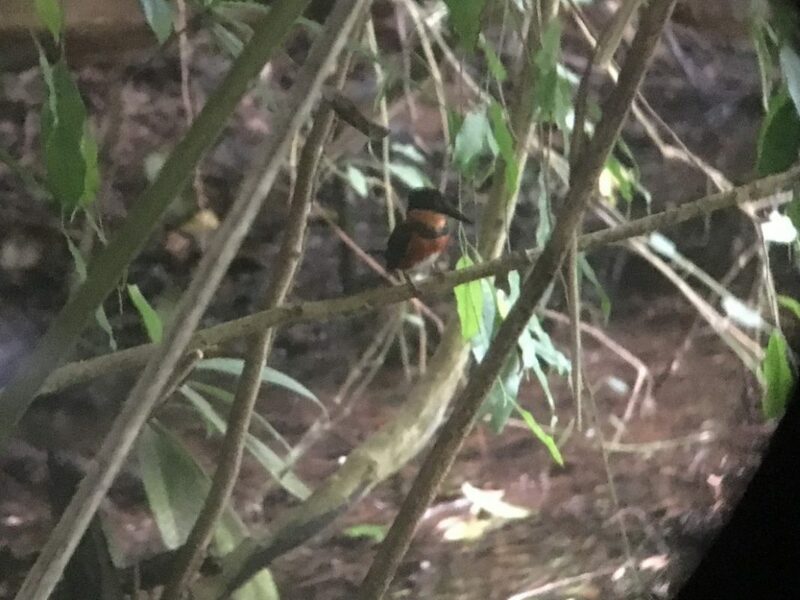 This was just one of the many exciting moments from several weeks of intense birding around the environs of Osa Verde Lodge and Osa Biological Station. 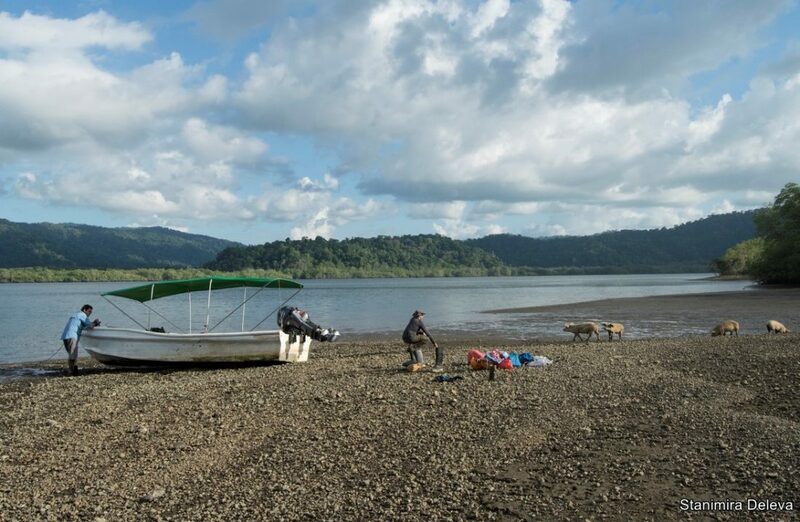 All of this birding was part of a citizen science project through Osa Conservation and partner National Geographic Eco Lodge Lapa Rios in order to establish a set of long-term point counts for bird biodiversity. We would pick spots in certain areas of the property around the lodge – including the primary and secondary forest, our restoration experiment plots, and open garden areas – and we would record all of the bird species we could see and hear at that spot. This information was entered into eBird, a global database of bird sightings contributed by everyday people. Scientists then use this data to track movements of certain species, map distributions of birds in different places, and define key areas for species of conservation concern that need to be protected. Throughout several weeks of conducting point counts, the other interns and I had many exciting discoveries like the potoo. Whether it was a Spectacled Owl perched up along the Tangara trail giving deep resonant hoots, a tiny American Pygmy-Kingfisher twittering above the swamp on the Discovery Trail, or a Tamandua snoozing in a small tree along the trail, there were always new and amazing things to find while interning at Osa Conservation. The Osa Peninsula is a place where, even after hundreds of exploratory expeditions, there is always something to be discovered. 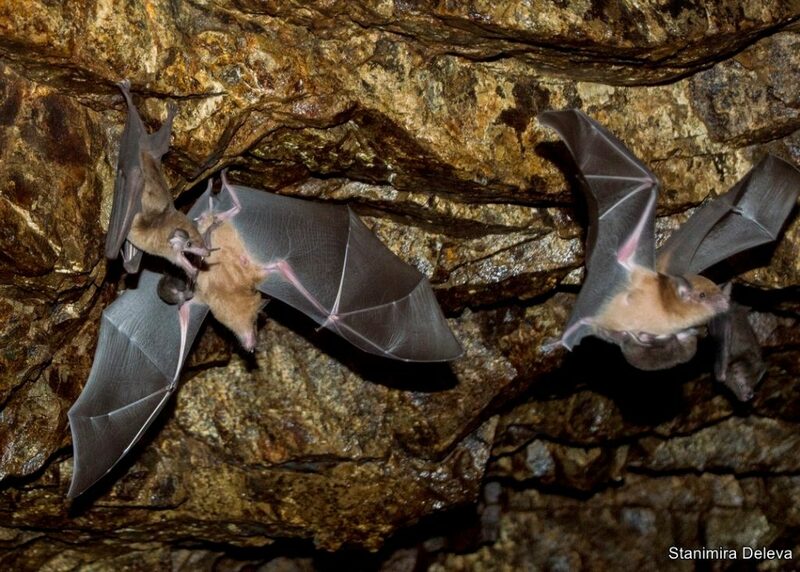 As one of the world’s most biodiverse sites, the Osa is home to a vast variety of bats, most who use caves as a refuge, that have not yet been fully explored. I first visited the peninsula in 2015 to study the bats. 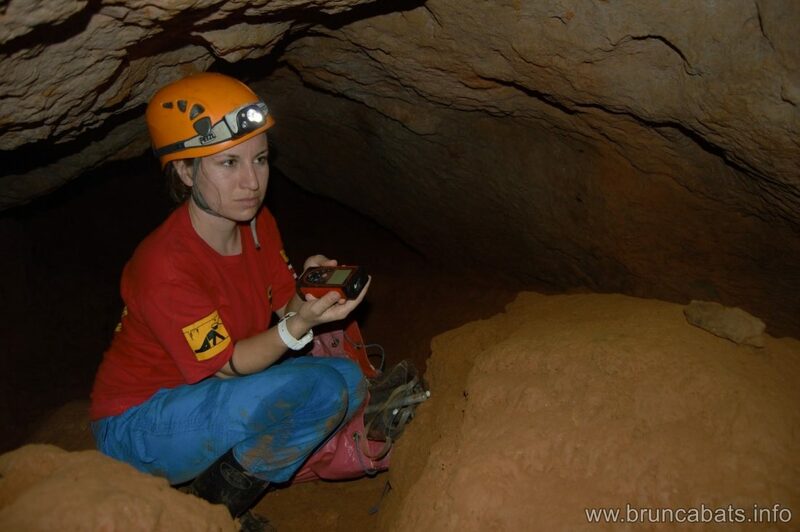 Several of the bats that we caught in mist nets were cave-dwellers. I wondered where these bats live, since no caves are officially known on the peninsula. There were two options: bats have either changed their ecology, or there are caves we don’t know about. As a specialist on cave-dwelling bats, I was intrigued by this question and started to plan a cave exploration expedition on the Peninsula. 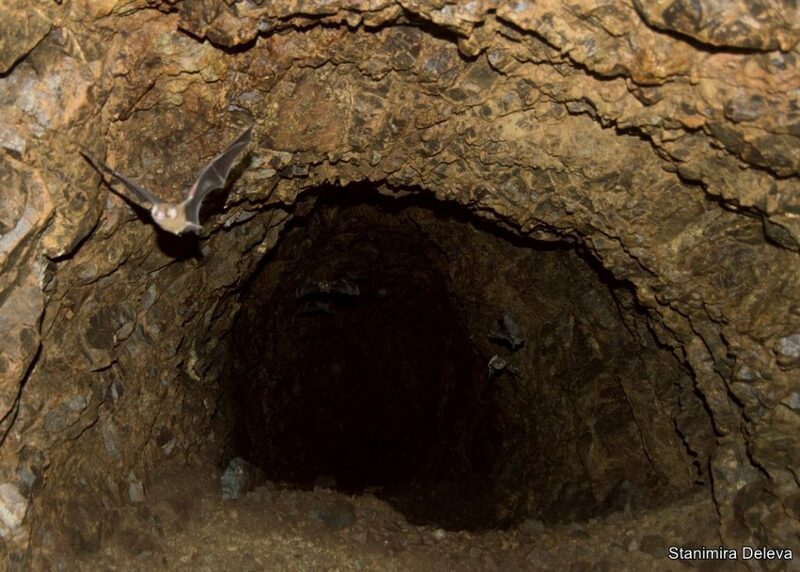 I knew that discovering large cave systems in Osa was unlikely because of the lack of limestone that rock caves are generally comprised of, but my experience in Costa Rica showed me that small volcanic or sea caves can be as populated with bats as large caves and just as interesting. In front of the entrance of Catatatas Cave near San Josecito. 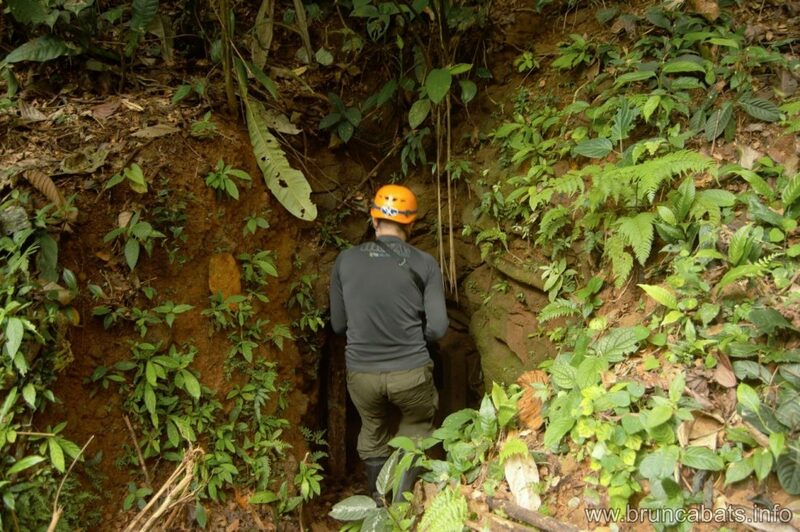 This year, thanks to the strong support of Osa Conservation, I was able to search and explore caves and other underground habitats on the Peninsula. I had previously identified several sites for searching, like an interesting old gold mine near La Palma. The landowner informed us about the mine when he found out that we were looking for caves, so we paid a visit this February. We managed to create a map of the interior parts, and marked bat colonies instead of gold treasures. 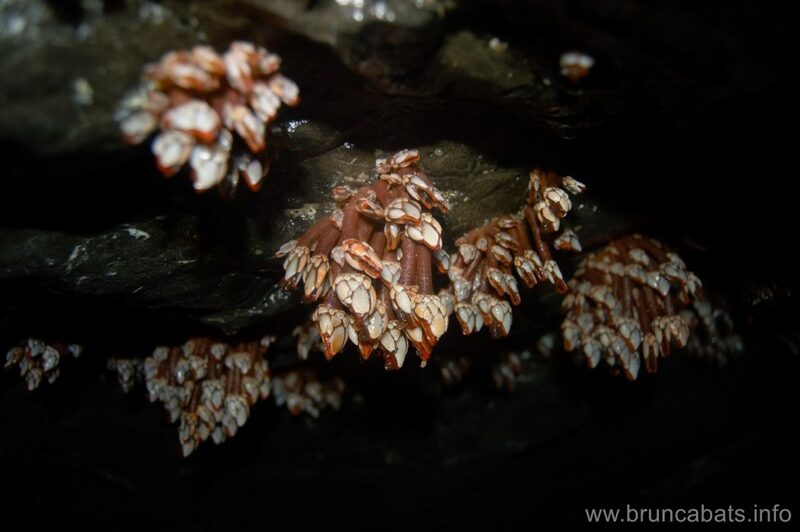 For several hours in the cave, we described the specific features of the relief and microclimate and discovered that the cave was over 200 meters long and branched like a maze. We also found two species of bats and an extremely rich invertebrate fauna. The narrow entrance of the old coal mine. Goose barnacles discovered in one of the marine caves. Next, we searched for sea caves on the west coast of Osa. On previous trips, we had known that these sea caves existed there, but we had not mapped them. So, after a few hours of hiking from the San Josecito beach, we set out to explore three caves. 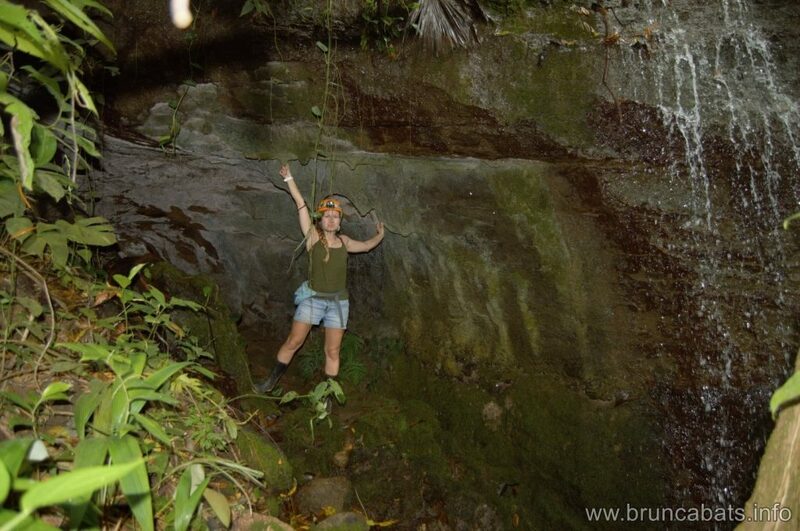 The cave near the Campanario research station shelters one of the biggest colonies of mustached bats in Costa Rica with several thousands of individuals from three species! 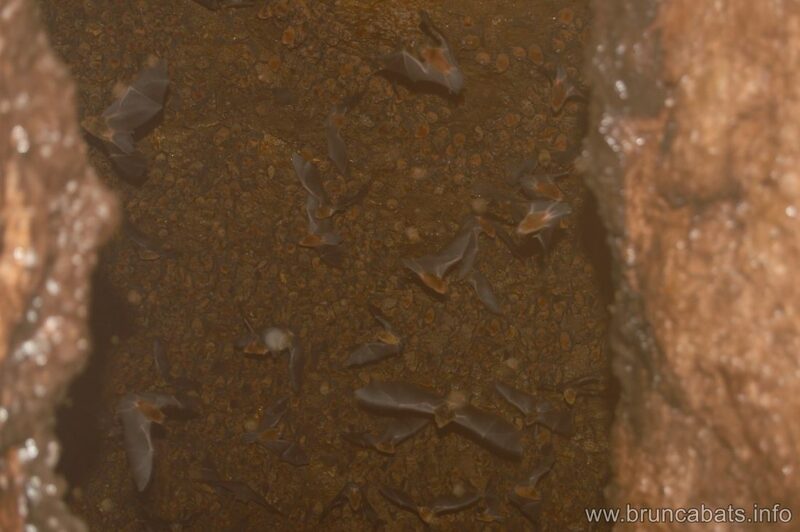 A bat colony in the marine cave. Exploring marine caves in Isla Violin. I found out from local people about a cave on Isla Violin. This island is hard to reach, but I managed to organize a visit, thanks to the people at Violin EcoLodge who helped me with the field expedition and took us to the cave by boat. 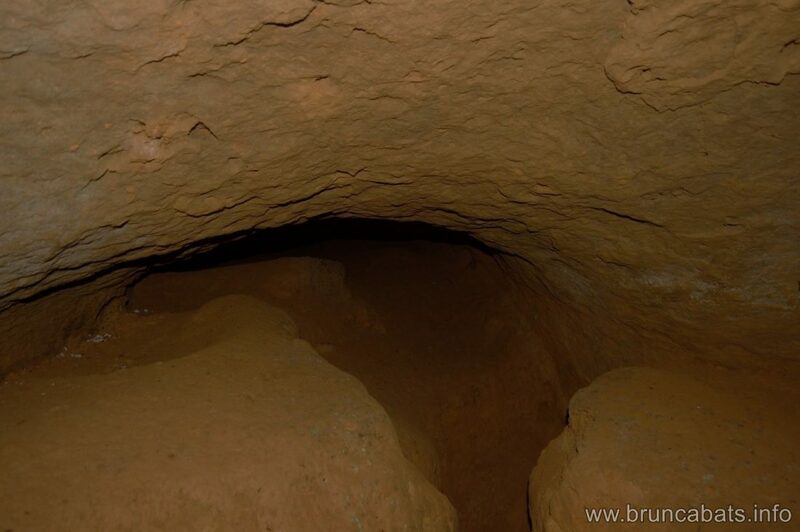 The “cave” turned out to be an abandoned gold mine once again. And this time we were fascinated by the variety of bats we found—over 500 bats of 6 different species! Difficult access to the cave has kept the bats undisturbed from any raiders. On the floor of the cave, we noticed many invertebrates. 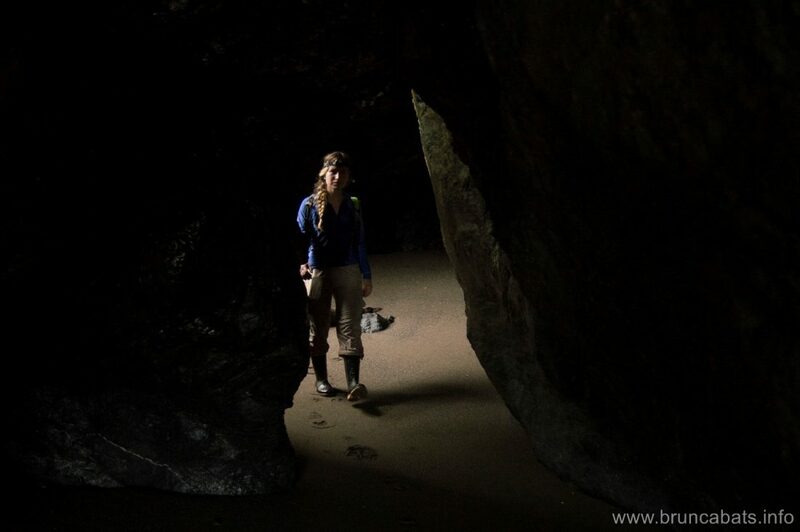 During this expedition we found another cave on the island, located on the seashore. We rode horses to cross the island because our boat could not stand against the intense waves around the beach. After reaching the beach, we had to compete with the coming tide by jumping between waves and climb several boulders in order to reach the sea cave. Finally, we found the cave, but alas, there were no bats. We made a sketch and left, racing with the coming tide. 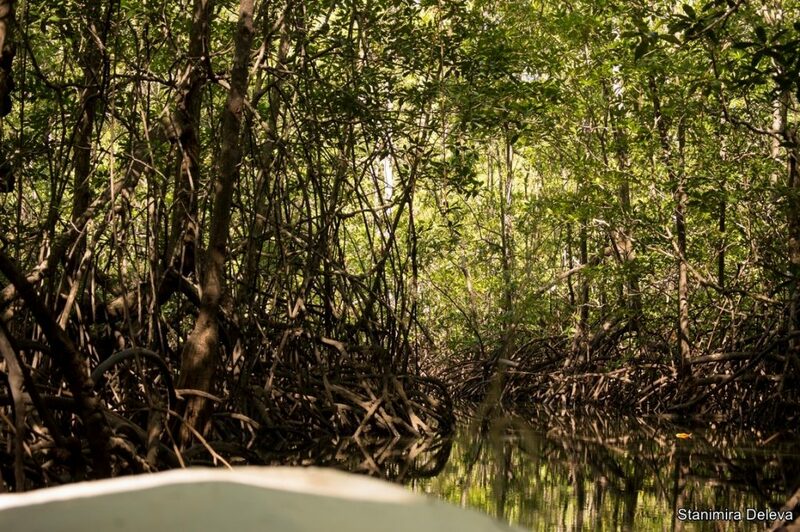 The boat ride through the mangroves was an adventure on its own. Bats in the Isla Violin cave. 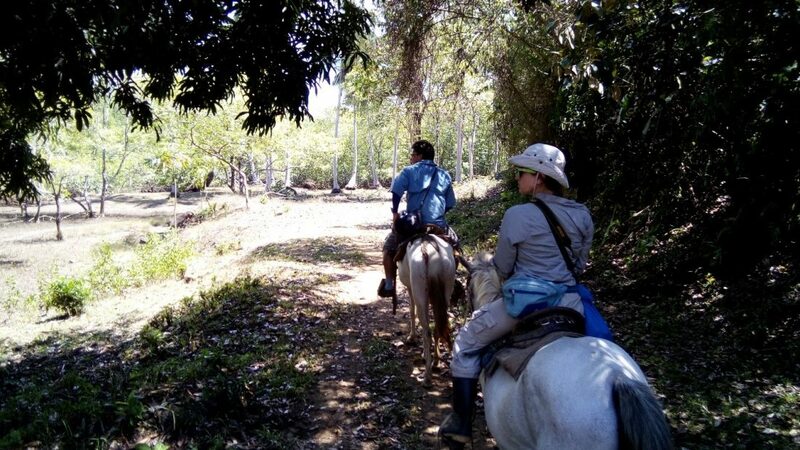 Crossing the island on horseback. 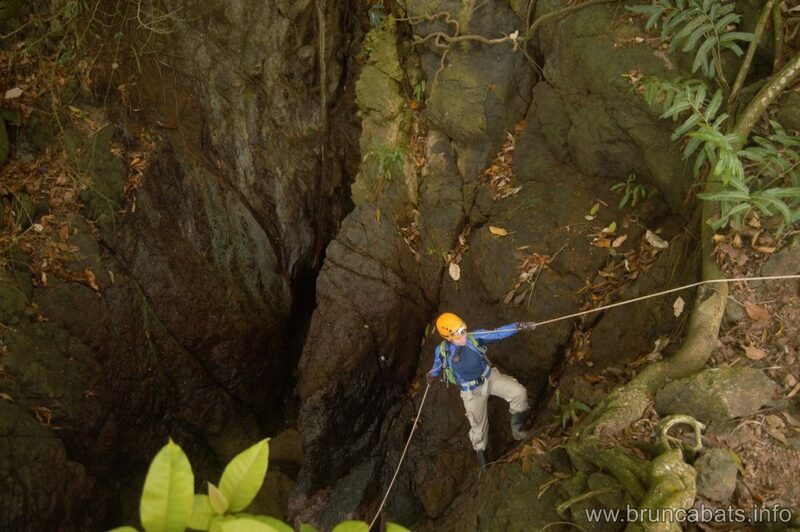 Our next plans are to explore the southern part of Osa around Sirena station, where we learned of another promising bat cave. We hope to find other hidden treasures!